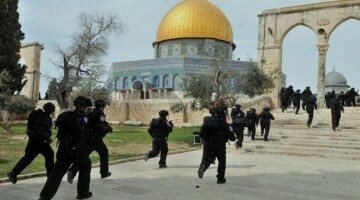 On Sunday, April 13, two days before the seven-day Passover celebration began, Israeli security forces were dispatched to Jerusalem’s Temple Mount (Dome of the Rock) to quell a riot instigated by Palestinians who were throwing stones at visiting Israelis. Police, too, were pelted with rocks and with Molotov cocktails; they responded with stun grenades and rubber bullets. The Arab rioters brandished Hamas flags and barricaded themselves inside the Dome of the Rock. Presumably, these Muslim extremists were trying to prevent any Jewish presence on the Temple Mount during Passover, as that would clearly mean the Jews were there to worship on this High Holy Day. Though dispelled, the rioters succeeded, as Jews were banned from Temple Mount during most of the Passover seven-day observance. Unrest and confrontations on Temple Mount are anything but new; however, this pre-Passover incident was more violent than most. Plus it was the latest of several incidents that seem to be increasing in number and intensity. On March 20th, while ascending Temple Mount, MK (Member of the Knesset) Moshe Feiglin and his group were attacked by stone-throwing Arab youths who screamed “Allah Akbar” during the assault. Prior to that (March 16th), Israeli Housing Minister Uri Ariel was forced to leave the Temple Mount when Palestinian Muslims turned violent. Weinberg goes on to say, “And of course illegal Waqf excavations continue on the Temple Mount without Israeli archaeological supervision. We know that over the past decade the burrowing-out by the Waqf of the underground Solomon’s Stables has wantonly destroyed thousands of years of Jewish relics and history. It seems that the Palestinians are neither willing to countenance live Jews on the Temple Mount nor dead Jews on the Mount of Olives.” (Here, Mr. Weinberg is referring to hundreds of Jewish graves). *Note: During my trip to Israel in March, 2006, I would have been extremely disappointed had I been prevented from stepping foot on the Mount of Olives or the Temple Mount, two of my favorite holy sites. To further demonstrate this hypocrisy, the Jordanian Waqf maintains ultimate authority over who is allowed (or not allowed) to enter the confines of Temple Mount; and, under no circumstances are Jews permitted to pray or exhibit any signs or gestures or acts of worship while on Temple Mount. If a Jew were seen with his head bowed and lips moving, the response would be immediate expulsion from Temple Mount, as that would be indicative of praying. Frankly, that would be no different from a Muslim organization in America (or any other organization) refusing a United States citizen permission to visit the Statue of Liberty. Or if, visitation was allowed, by then attacking American citizens or foreign tourists once they set foot on the premises. It all would depend on whether there were any rioters present at the time. In response to Ariel’s stated intentions and increasing demand by several Israeli MKs and government officials, as well as by an increasing number of Israeli citizens, the Knesset has recently begun to listen to Jewish demands to pray and worship on Temple Mount. For readers of this article that may not be fully aware of the importance of the Temple Mount to both religious and secular Jews, let me paraphrase what has been stated in a couple of previous Eye of Prophecy articles: Jerusalem is the very heart and soul of Israel, and the Temple Mount is the heart and soul of Jerusalem. It is none other than Mount Moriah, where Abraham nearly sacrificed his only son, Isaac; and later the site where Solomon’s Temple and the 2nd Temple were built. Unfortunately, it is also the location of the Muslim Dome of the Rock, built some 1600 years after Solomon’s Temple and 1150 years after Ezra and Nehemiah’s Temple. The Muslims knew full well what they were doing when they erected the Dome of the Rock: deliberately replacing the most holy site of the Jews with a mosque that would usurp all Jewish religious and historical rights to Mount Moriah and to Jerusalem itself. Today, Islamists are rewriting history by teaching Arabs (and all others who will listen) that the Jewish Temples never existed in the first place. It’s true that Israeli officials have (ever since Israel won the Six-Day War including recapture of Jerusalem and the Temple Mount) disallowed Israelis from worshipping on the Mount, but only to maintain some semblance of peace and prevent the very kind of viciousness that is becoming all too common … violence that is always instigated by Palestinian Arabs. That’s why Israeli police were stationed at Temple Mount in the first place: To first and foremost enforce the rule that Jews cannot worship there. In other words, to comply with and enforce an edict that comes straight from a foreign country … Jordan. But, as indicated, the ever-growing attacks by Palestinians are directed against Israelis just for being on Temple Mount regardless of the reason, which they are allowed to do at certain hours of the morning, as long as no praying or worship is displayed. It would be tantamount to British activists trying to prevent Americans from seeing the Washington Monument in our nation’s capital under the alleged pretense that British sovereignty and history was being desecrated just because America won the Revolutionary War and made Washington D.C. our permanent capital. What kind of reasoning is that? Would you tolerate such convoluted logic and intimidation and simply bypass the Washington Monument? Just contemplate for a moment: What would be the reaction of Americans if Mexico issued a proclamation that United States citizens could visit the Alamo in San Antonio, Texas only under strict conditions and only during certain hours of the day? Plus, after stepping foot in the confines of the Alamo, they could not, under any circumstances, salute the American flag or even carry a flag or utter a single word about the brave Americans who died defending the Alamo. And woe betide them if they bowed their heads and uttered a prayer, one that God himself gave as a model to Israel and any nation that seriously wanted God’s blessing: “Then if my people who are called by my name will humble themselves and pray and seek my face and turn from their wicked ways, I will hear from heaven and will forgive their sins and restore their land” (II Chronicles 7:14). Your immediate response might be: “Now you’re talking about the need for Americans to humble themselves before God, acknowledge our wickedness (such as government sponsored abortions), and seek God’s forgiveness and guidance.” And you would be right … but only because of a little rabbit trail departure! My main emphasis was an analogy between a foreign nation imposing political, religious, and cultural demands on American citizens in the same fashion that citizens of Israel are prohibited from exercising their God-given rights to freedom of worship in their own land, at the holiest site in all of Judaism, whenever they choose, without fear of racial insults or bodily harm or death. 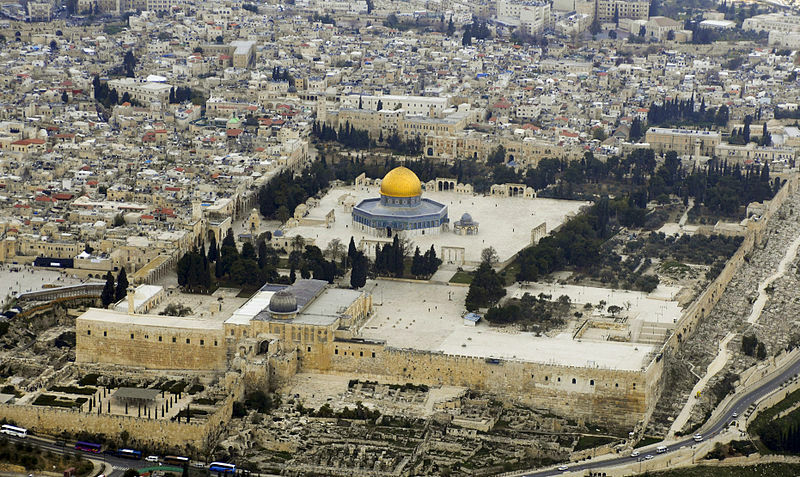 How important is the Temple Mount to the Jews and to Israel? I’ll tell you how priceless and precious it is. Although President Mahmoud Abbas of the Palestinian Authority has imposed several conditions on the Israelis before he will even sit down at the negotiating table, Prime Minister Netanyahu has imposed only one condition: Recognition of Israel as a Jewish State. And, incorporated in that stipulation is the implied and default component that Jerusalem is Israel’s undivided capital. Virtually all other issues are negotiable to the Israelis. But Jerusalem will not be divided between east and west, and the Temple Mount must not be (permanently) annexed by a people who aren’t even citizens of Israel. Even though I understand why, it’s nevertheless completely amazing to me that Israel relinquished a single square foot of Jerusalem to Jordanian or Palestinian control after re-capturing the holy city in the Six-Day War of 1967 at the highest price possible—the blood and lives of their soldiers and civilians. Why did they give back part of what they won in battle? Sad, but easy answer: To maintain a semblance of peace through appeasement of the Arabs but mostly as a concession to global pressure, including the United States. It’s apparent that Israelis are growing tired of constant unrequited demands of conciliation not only from the Palestinians, but by Middle East Muslim nations; and not only by Muslim enemies who have sworn to destroy Israel such as Iran, but also by allies of their enemies, i.e. Russia, China, North Korea, Indonesia. But the worst of all: Western nations, especially European, whose citizens are displaying overt and ominous signs of Anti-Semitism almost on a daily basis. And, with a great deal of alarm, I’m beginning to wonder about the loyalty of the Unites States toward Israel. Many Jews, especially the observant Jews, but also non-observant (secular) Israelis—some who are MKs or State officials—are beginning to question the right of the Israeli government and certainly the right of a foreign nation or non-Israeli citizens such as the Palestinians of the West Bank and Gaza Strip to place strict regulations (or any regulations at all) against freedom of movement and worship on Temple Mount. But the recent and renewed interest in the Temple Mount is not just based on an increasing discontent with these restrictions. I firmly believe the primary reason for this resurgent passion toward Israel’s revered and venerated holy site has much more to do with the crescendo of enthusiasm over the coming of Messiah. An integral part of this desire for His appearance is the eagerness to rebuild the Temple. There are several organizations in Israel whose members are devoted to this 2000-year old dream, none more so than The Temple Institute. A Rebuilt Temple … just a matter of time? The Temple Institute considers it their mission to, “…educate about the great significance of Mount Moriah, the Temple Mount in Jerusalem, the only site in the world that is considered holy by the Jewish people, and the only site in the world which G-d chose to rest His presence through the establishment of the Holy Temple.” *Note: Most observant Jews do not insert the vowel when they write the English name of God … this out of total reverence for Hashem (The Name). I’m referring to the Old Covenant name of God that he gave to Moses … I AM who I AM or Yahweh. Or more accurately: YHWH. Referencing the April 13th attack at the Temple Mount and blasting the Jordanian Waqf (Muslim Trust), Temple Institute International Director, Rabbi Chaim Richman declared, “In the middle of Jerusalem there is a city-state with diplomatic immunity where the enemy flag is unfurled and where plans are being made to attack Jews … that is absolutely unspeakable.” Of course, the city-state referenced by Rabbi Richman is the Muslim Dome of the Rock—compared to the Vatican (city-state) that has complete control over all people and activities conducted in Vatican City. Among other things, the Vatican has diplomatic immunity and separate sovereignty from the Italian government. Another entity called, The Temple Mount Organizations is an umbrella group promoting Jewish rights to the Temple Mount. On April 10, they conducted their third annual “dry run” of a Passover sacrifice. That date was the tenth day of the Hebrew month of Nisan, the day instructed by God for the Hebrews to begin preparation of their lambs for the first sacrifice (Exodus Passover). To then be observed on an annual basis. Many Rabbis in Israel—indeed, all over the world—believe the Messiah could arrive any day. Accordingly, they contend that members of the priestly families who will be responsible for conducting Temple services need to be ready. Currently, there are those in Israel (in the family tree of Levi) training for the priesthood. Sacred Temple vessels have already been crafted by the Temple Institute, and priestly garments are being fashioned to precise Biblical specifications. How right they are! End time prophecies are, indeed, unfolding before our very eyes. I’ve sometimes fancied myself born in previous generations. What would I have done, have become? What would it have been like to follow George Washington into battle with the very future of the United States of America at stake? Or a pioneer in a covered wagon on a dangerous, but victorious journey to beautiful California. Or alongside of Christopher Columbus on his way to a Brave New World? So many possibilities, so many quests. But if God gave me a choice to live in a dozen past generations with a hundred exhilarating (but safe!) adventures, I would turn them all down to live right now, for such a time as this! No, I wouldn’t trade any time in history for the present day … hopefully for the awesome thrill and privilege to be transfigured and transported directly to heaven in the Rapture. To watch daily events through the prophetic binoculars of the Word of God, and to watch as the hope of fellow believers increases exponentially for that final trumpet to sound. The entire earth is being prepared for the awesome return of our Lord and Savior, Messiah Jesus. Nearly every month another piece of the prophetic puzzle is assembled. But to our Almighty God in Heaven, it is not a puzzle at all. It is a beautiful, magnificent tapestry intricately woven together from the ancient past. It is like a very long parade seen only one float at a time by humanity, but viewed in its entirety from above by our Glorious God. Everything from the salvation of souls all over the world (including Israel) to the planning and preparation for the coming 3rd Temple, right down to the utensils used! Recently, two men, Moshe Hachim and Eli Yorav requested permission from Israeli police officials to conduct a sacrifice on Temple Mount, by means of a portable alter, wood (for the fire), vessels for collecting the blood, and other needed instruments. And, of course, a lamb! I do not know the result of this petition. Undoubtedly, it will be rejected. But only for now. One day it will happen. When it does the time will be very, very short for Messiah’s majestic return to the Mount of Olives, not much more than a stone’s throw from Temple Mount! “After this, the man brought me back around to the east gateway. Suddenly, the glory of the God of Israel appeared from the east. The sound of his coming was like the roar of rushing waters, and the whole landscape shone with his glory. This vision was just like the others I had seen, first by the Kebar River and then when he came to destroy Jerusalem. I fell face down on the ground. And the glory of the Lord came into the Temple through the east gateway” (Ezekiel 43:1-4). Can the glory of the Lord (Messiah, himself) enter a Temple that hasn’t yet been built? Don’t miss next week’s article: Part II of the Jewish Temple, beginning with: Will there be a Third Temple. If so, When and Why?